Re-enacting historical events from the mythical past has always been a major feature of the Urasoe Tedako Festival. 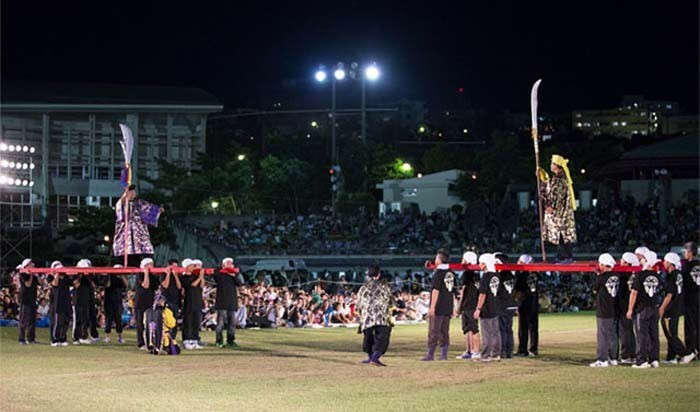 Tedako means ‘children of the sun’, and the annual three-day festival pays homage to a powerful king of the central Ryukyu before it was united into one kingdom. King Eiso had his court in Urasoe, with the royal castle in what is now the Urasoe Castle Ruins Park. The festival begins with a block party on the Yafuso Street on July 22nd that will be closed to the traffic from 14:00 to 21:00. Fireworks end the festival on both Satur-day and Sunday. The Tedako Matsuri itself begins at 14:00 on Saturday, July 23, with a ceremony of taking the fire from the sun at the Iso Castle Ruins Park. Events on Saturday and Sunday include several all-day sports competitions. The main venue of the festival is Urasoe Sports Park where all live concerts and other entertainment takes place in the evening of both days. 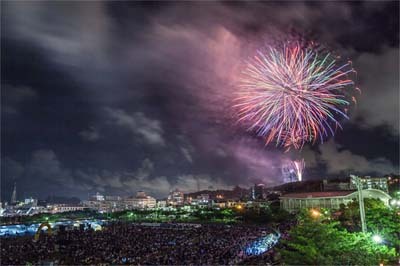 On Saturday, the Picture Scrolls Of The Three Great Urasoe Kings starts at 19:40 p.m. on the Main Stage at the Festival Grounds, followed by the Great Fireworks Show at the Main Stage beginning at 20:45 p.m.
Tedako Festival dragon boat races take place Sunday at Makiminato Fishing Port. 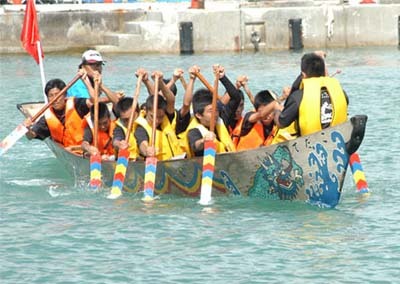 Sunday’s events include Dragon Boat Races at Makiminato Fishing Port just off Hwy 58 starting 9 a.m. and continuing all day 09:00~17:00. Several live bands are on the main stage in the evening, and the Great Fireworks Show at 20:45 ends the festival. There’s something for everyone throughout the afternoon at locations within the Urasoe Athletic Park, so take your cameras to capture the spectacular action.